community in Canada is diverse, thriving, and incredible. Every phone call we get from parents of kids with Down syndrome or their family members, a person working with our community, or a person with Down syndrome, tells us so much about our community. We’d like to share some of these stories with you. Do you have a story worth sharing? We are currently looking for stories from self-advocates (people who have Down syndrome) and professionals. Submit your story using our contact form and your story may be posted! In 2017 – Canada’s 150th and CDSS’s 30th anniversary – we have been featuring stories from families in the Down syndrome community. 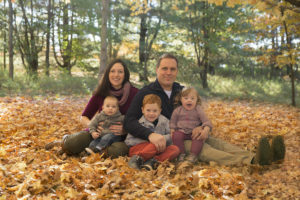 Here, Guelph mom Mary Casagrande writes a beautiful letter to new parents. Mary’s letter appears in the book 21 Welcomes, which is part of the package for new parents that CDSS sends to new parents and maternity wards all over the country. We want to start off by saying congratulations. You may not know it yet, but you’re embarking on a one-of-a-kind adventure that will truly change the way you look at life, people, happiness, and love. We know how difficult these early days of finding out your child’s diagnosis can be. We were there too, at twenty weeks pregnant and feeling like the world was crashing down around us. We didn’t think we would be strong enough to be parents to a child with special needs. You will surprise yourself by the strength you have within yourself and the abundance of love you will feel for a child whose diagnosis may have initially brought you so much sadness and grief. If we had known how beautiful life would be with our daughter Emma in our family, if we had known how much happiness she would bring to everyone around her, we would have shed a lot less tears back then. If we could have fast-forwarded and seen what a beautiful relationship our son has with her, we would not have grieved for him not having a typical sister. Emma’s smile can light up anyone’s day, her giggle is contagious, and her perseverance inspiring. Her beauty radiates both inside and out. We feel so incredibly blessed to have her in our family. Go through these steps of grief you are currently feeling. It is important to allow yourself the time to heal from the loss of the expectations you had of having a typical child. Letting go will allow you to make room in your heart for a whole new wonderful that will surprise you. For more stories, download the New Parent Package or contact us for a printed version. Our 30th anniversary and Canada’s 150th give us an opportunity to look back as well as ahead, to observe how Canada has changed as an inclusive society. And so we are happy to share some older stories from members. In this story, long-time supporter Jack Long of Toronto shares some poignant family memories. My parents grew up on Manitoulin Island, which is an Ontario farming community in Georgian Bay in Ontario. My father had a stable, happy childhood but my mother’s childhood had been a very difficult one. She had been adopted into a family where she had been more or less treated as slave labour. She was only allowed to go to school for four or five months each winter, when there was less farm work to be done and as a result she only achieved a third grade level of education. At the age of seventeen, she managed to escape and ran away to Sault Ste. Marie and never went back. However, by 1938, her life was certainly moving in a happier direction. 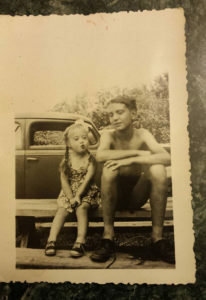 She had married my father, a wonderful man who had grown up on the next farm, and they had moved to Toronto when my father returned from the war since he had been badly wounded and could not return to farm work. They had three happy, healthy children and in spite of the bad start, her life had become a rewarding one and she was enjoying every part of it. In 1938, when I was eight years old, my parents had their fourth child, a daughter who was called Geraldine. Although she was healthy at birth, by the time she was a few months old, they began to realize that she was not developing typically and they went to a doctor who specialized in children’s problems to ascertain what the trouble might be. This doctor diagnosed Geraldine with “mongolism,” as Down Syndrome was called at that time, and told them that Geraldine would not likely live past thirty years of age and would never develop beyond a very low level of intelligence. Of course, this devastated my parents, particularly my mother, whose unhappy start in life had made her extremely vulnerable to this kind of bad news. My parents, however, were not satisfied with this assessment and went to see a Doctor Cotton. This doctor took a much more positive approach and while not denying the original assessment, worked rather on my sister’s physical health and tried to explain that she would still be a part of the family, and could give us many happy moments. Although this did alleviate my mother’s concerns somewhat, the damage had been done and it was reinforced every day as Geraldine continued to fall further behind other children in walking, talking and the skills that children learn in their early years. My mother went into what I now know was a deep depression, which lasted for at least five years. My brother was ten years older than I was and enlisted in the Air Force at the start of the war in 1939, and my older sister was eight years older than I was, so their lives at this time were mostly outside of the family home. My father left for work early in the morning and got home around seven o’clock in the evening and in those days his job was six full days a week. By the time he would get home, my mother would have pulled herself together and would carry on a fairly normal conversation with him. I was the family member who was at home with my mother and Geraldine much more than the others. Although I’m sure my father was not happy about the situation, he never showed any negative feelings to me. My school was not far from home and I came back for lunch each day. As I remember, my mother would be crying when I got home about 12 o’clock and still crying when I left to go back to school at about 12.40. This daily situation had a strong effect on me, and seeing my mother this way made me also very unhappy. I worked with Geraldine almost every day, teaching her as much as I could to respond to directions and play games, and eventually to read and do simple numbers drills. She was a very nice little girl and I never resented the idea that I felt that I had to spend so many hours in this pursuit, while my friends were free to play or do whatever they wanted. My immediate purpose was to be able to impress my mother with the progress Geraldine was making. In this way, I thought that maybe I could cheer her up and family life could return to the way it had been before. My life outside of the home was very active and rewarding. I played sports, was a boy scout, had good friends and participated in many enjoyable activities, but when I came home, my life changed to that of a teacher, working toward the desired goal of helping to lift my mother’s depression. My friends at school didn’t know about my other life; none of them ever came to my house and although some of them may have known that I had younger sister who had some “problems,” none of them knew the full story. I remember thinking that I would probably never get married because that would mean divulging the family’s secret to the outside world and I didn’t think that I would ever be able to do that. Geraldine did learn to read children’s books and got quite good at helping my mother around the house. Because of her very pleasant personality she became a favourite of the rest of the family. After a few years, my mother gradually came to accept things as they were and slowly returned to a happier life. Although she never totally recovered from her earlier unhappiness, she did achieve a level of contentment that enabled her and my father to live into their nineties, while leading active and satisfying lives. One of their biggest concerns had always centred around their worries about what would happen to Geraldine when they were unable to look after her. This was resolved by my wonderful older sister, who accepted this as her responsibility and always ensured that Geraldine was happy and being well cared for until she passed away at fifty-six years of age. While all of this was happening it had a great effect on my childhood, but looking back, I don’t believe the effect was negative in the long term. It made me grow up rather quickly and also taught me that other people’s lives are not always as happy as they might appear to be on the surface. I have known Manny for a little over 4 years but feel as if I’ve known him forever. We are a blended family. This arrangement is not without its challenges of integrating children, ex-spouses, grandparents and extended family. We are getting the hang of it and so far it is working for us- the future is looking bright. When his dad and I got engaged, he asked me if I was prepared for what would lie ahead for me and the challenges of a special needs child. Was I prepared? Was I ready to take the plunge? Not only would I be sharing my life with another person but also extending my arms to two other children. Having had one marriage that didn’t work out, I was somewhat cautious and full of trepidation about going into a marriage with this extra challenge. What I have learned from Manny is more than some people can learn in a lifetime. Most of all he puts life in perspective for me. I have learned (or am learning to) not sweat the small stuff, to laugh and to be silly. Perhaps the greatest lesson of all though is to have patience and to never underestimate his ability or his wisdom. Manny will be going into Grade three next fall and finds school challenging. With all of its expectations and rules he often struggles to make sense of it all. The teachers work with his parents and so he progresses and learns how to manage his frustrations. His two loving parents and the community we live in all work together to support him. In all of the stores he frequents and activities he goes to, everyone knows him and loves him. He is a child who exudes enthusiasm and always has a zest for life. Manny is a straight shooter. I always know where I stand with him. If he is upset, he lets you know. As his dad puts it “he is no politician” and however he feels is always very obvious to us all. The flipside is the joy he brings and that unabashedly loving side to him. His innocence will always stay. There will be no jaded, cynical side to him as he gets older. He will always believe in Santa, the Easter bunny and the Tooth Fairy. The innate ability to spot a person or sense someone who may not be kind to him is always present. Society has progressed but not everyone is comfortable with or caring to a special needs child. Manny has learned over the years, sadly, to avoid people like that and seems to be able to keep to those who will love him. He is not a sedentary type of child. He is a terrific swimmer and can stay in the water for hours. This often allows his dad to sit for a few minutes. Manny doesn’t sit much himself and can keep us all going most hours of the day. We all have to keep our eyes on him as he has been referred to as ‘a flight risk!’ When you least expect it or turn your back for a second…whoosh and he’s gone. One day last year we were at home and couldn’t find him anywhere. We called his name and no sign. Moments later we found him tucked behind the living room curtains…his feet were the telltale sign. There he was with a tub of ice cream in his hands, furiously scooping it into his mouth before his imminent discovery. Manny is a child who loves routine and we all work together to provide that for him. At the dinner table, we all take turns talking about the best part of our day. Manny directs us all to raise our hands when we speak and gets very excited when we give answers that he likes. He is the teacher at our dinner table- if he doesn’t like the answer, well, we know about that too! Following dinner, it is theatre time and all of us (I have a son and Manny has an older sister) sit down to watch the show. Manny writes, produces and directs the show- usually involving his stuffed animals doing various dancing routines. He is very engaging and his creativity and imagination knows no bounds. After the show is over we all clap and applaud our budding superstar. Manny usually bows and then hugs us all. He loves affection, loves to snuggle and his hugs will melt your heart. I hope as Manny grows older that he continues to receive love, kindness and acceptance by this world. I have learned so much from him and for that I will be forever grateful. For he has taught me that when I see a child with special needs I look at that child to see what he or she can teach me. To smile and have a look into his or her world and all of their remarkable gifts they can bring to us. Today as I walk through a mall or go to a park and see a child with these unique traits, I count my blessings that I took that leap and got to know and love Manny. When our son was born almost eighteen years ago, my husband and I asked if he would be able to father children. The answer was that he would probably have non-effectual sperm and would be infertile….however the Doctor added, almost as an afterthought, there was one man with Down syndrome who was believed to have fathered a child. To us, it did not feel like an excellent answer and we were left in a fog. As part of Ups and Downs’ Visiting Parents Program, I have had to give that same inadequate answer to many new parents. I knew it was a poor reply but I never had anything better to add. One particular mother was more interested than most and pressed me for more concrete facts. I tried so hard to get her some better information. I called the Developmental Clinic, who had the same information as me, so they passed me on to the Genetics clinic. I still got no further than the answers that I had been given when Rowan was first born. It was five years ago that I had tried to answer that new mother’s queries and I was left feeling frustrated. It was a thorn in my side that I never forgot. Thus, this past summer, when we were informed that our son had an inguinal hernia, I asked whether the Doctor could take a sperm sample while our son was under anesthetic for the hernia surgery. She seemed rather taken aback, especially when I said I was hoping that she could confirm that my son had ineffectual sperm so that, if he were ever sexually active, he/we would not have to worry about birth control. She explained that usually her patients’ parents were worried about the opposite; they feared anything that might make their children sterile. Despite her wide eyes at my request, she did her due diligence and found a urologist who was willing to do the procedure, which was called a testicle biopsy. Yes, it turns out that his sperm was completely normal. Even the urologist was surprised. As an added bonus, when I studied the lab results, it appears as though the biopsy checked (and found his testicles clear) for some sort of cancer (I wondered if the cancer test was given as the excuse as to why they were actually doing the biopsy). I don’t think sperm testing is routinely done on boys/men with Down syndrome and I do have to wonder why. another, I wanted those parents who have boys with Down syndrome to be aware that their sons may be just as fertile as our son. Would his sperm produce children with Down syndrome? I imagine that would require further genetic testing and it was never my burning question. My main query had been answered; his sperm was alive, functional and could contribute to the formation of a new life. How did my husband and I feel about the results? It seemed to me as though my hubbie was proud of his virile son and, I suppose I somehow felt the same. Originally, as I said, I had wanted to know that we would never have to worry about birth control but ultimately I suppose it was uplifting to hear that one more thing about our lovely boy was not dysfunctional or different. Later my husband added that he was pleased by the breaking down of one more stereotype; society had wrongly assumed that those Down syndrome boys are obviously sterile. How does this change anything? Perhaps it doesn’t. Our son may never have a serious girlfriend or wife and he may never be sexually active. However, if he ever is, we now know that he (and/or she) will need to use birth control. 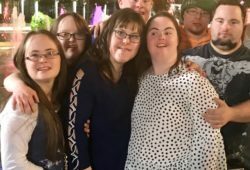 Knowing that 50% of women with Down syndrome can get pregnant, I always used to believe, from a parental point of view, that it would be ideal for women with Down syndrome to get romantically involved with men with Down syndrome. In that way all parents could relax, knowing that, if/when their sons and daughters became sexually involved, there would be no fear of (unwanted) pregnancies. Now I know differently. As an added thought, although I would never wish for my son to be a father, I have since discovered that some parents may wish for their sons to have that option available. Who am I to crush that dream? Eighteen years ago, overwhelmed by the diagnosis of my new baby, I was buoyed by a picture on the front page of an Ups and Downs newsletter; a photo of a married couple who both had Down syndrome. The thought that my child could have a hope of getting married, carried me through many dark days. Since then, we have seen people with Down syndrome doing all kinds of things that, back then, might not have been imagined as possible; actors/actresses, models, artists, athletes, employees, employers, photographers, musicians, public speakers and the list goes on and on. 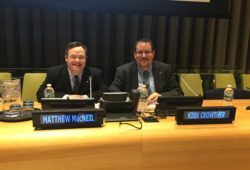 What then does the future hold for our kids with Down syndrome? None of us know and it seems that anything could be possible. My recent findings seem to support Dory’s sage advice that all that any of us can do is “just keep swimming”. Our son Shawn, who has Down syndrome, was born in Lahr Germany in 1989. The photograph on the right was taken shortly after he was born. Living in Germany at this time and knowing very little about individuals having Down syndrome was very difficult. Reference material in Germany was virtually non-existent. Luckily, when we moved back to Canada in 1990, we had much more material and assistance regarding Down syndrome through both CDSS and our local group. In 2001, we attended the Canadian Down Syndrome Conference held in Edmonton, Alberta. It was at this conference that we had the chance to really see what the future could hold for our son, Shawn. It was while attending this conference that we learned about milestones he may or may not reach, as well as finding out where and what services were available to us to help Shawn achieve these milestones. We went to many great workshops that were full of information; from the medical problems we could encounter, to what adult life might be like, as well as all the years in between. It was also a wonderful place for us to meet other families who have children with Down syndrome. It made us feel like we weren’t alone in the journey. There was a feeling of inspiration when we left the conference, we really felt that Shawn could go to school, have friends, have a job, and enjoy his life. I feel it was an excellent opportunity for our whole family to learn and exchange stories with other families going through the same thing as we were. I hope that everyone in the Down syndrome community has the opportunity to attend a conference. I know we have some great memories of the Canadian Down Syndrome Conference, and we are very excited to make some more in Edmonton this year! Gabrielle and Geneviève are twins. Geneviève has Down syndrome. Gabrielle does not. As part of an English assignment when she was 18-years-old, Gabrielle had to write a poem. She chose to write on a subject dear to her heart. Her sister. That they are not so different from me and you. And create lasting friendships that stay forever bound. Living life simplistically, moving at their own pace. You’ll see they are beautiful, passionate, successful and driven. With real understanding you’ll see them grow. On a walk with them that is long overdue. Music is the universal language that connects us all, regardless of age, race or ability. All of us have benefited from music as a learning tool. Think of a song that you learned as a child. What made it stick? Chances are, it had repetitive words and a simple, recurring melody. Perhaps it involved hand gestures or miming that helped reinforce the lyrics. Songs can help us remember and use language – it’s no wonder the alphabet has been set to music! Music can also be a powerful tool to help children with disabilities who have difficulty expressing themselves and communicating through verbal language. As a result of these challenges, children may experience stress, frustration and depression. Music can help provide comfort and solace, as well as a means of communication. For example, children can express themselves and their feelings by playing with instruments. Music therapy has been practised in Canada, the U.S. and Europe since the 1950s. Accredited music therapists help promote and maintain their clients’ mental, physical and emotional health. Using different forms of music, they encourage individuals to sing, move to rhythm, play with sounds, and improvise with instruments such as guitar, piano and percussion. Music therapy can help improve a person’s self-awareness and awareness of his or her environment, self-esteem, motor skills, attention span and communication. It also teaches turn-taking, following directions and making choices. Music therapy can be beneficial for children with various disabilities, including Down syndrome, autism, cerebral palsy, acquired brain injury, speech and language disabilities, mental illness and sensory integration disorders. “A child of any ability or disability can respond to and partake in music, and feel a sense of accomplishment and enjoyment from being able to do so,” says Michelle Quan, who is working toward her Master of Music Therapy degree at Wilfred Laurier University in Waterloo, Ont. Music can also help improve children’s attention span (they follow a song closely so they don’t miss their favourite part, or are engaged in the music because they’re playing an instrument), enlarge their vocabulary, and help them learn how to rhyme, take turns and wait (by matching the music to words or actions). Evie Allgeier, 15, of Kitchener, Ont., has Down syndrome and autism. She has been working with McLennan for many years, and with hard work and the help of her parents, she has made great strides in her speech and language. Now a teenager, Allgeier enjoys music therapy with accredited music therapist Taryn McKinnon. The therapy is also helping Allgeier cope with a medical condition. In 2002, she had a stroke that affected the right side of her body. Music therapy helps her use and strengthen her weakened side. Our daughter, Rachel, has always been a happy and fairly independent person. Sure, she’s needed some guidance and encouragement along the way, but what child or young adult hasn’t? Throughout her 24 years there have been educational opportunities, social outlets, and plenty of family and friend support. The one thing that seemed to be missing, however, was a real sense of being part of her community. That all changed a few years ago when Rachel was hired for her first job. To a lot of people this may not seem like that remarkable of an achievement, but for her it provided a tremendous source of pride and accomplishment. You see, Rachel has Down syndrome, and as a result, the “typical” progression of events throughout her life hasn’t always come that naturally. In March 2008, the Kootenay Society for Community Living (KSCL) approached our family with the prospect of implementing a supported employment program in the Castlegar community. Rachel had been involved with KSCL for many years and they had been remarkable in providing many opportunities for those with mental challenges, and this new undertaking was very exciting for all of us. Bernice Beckstead, one of the coordinators for the supported employment program, came with the belief that “employment is a positive and therapeutic activity that directly influences self-esteem, personal value and how people with disabilities see themselves.” She canvassed for suitable job placements for Rachel based on her strengths, abilities and interests, while also helping her fine-tune her resume and prepare for job interviews. Soon after this, Rachel was hired by Kootenay Family Place in North Castlegar and began working there. Her duties ranged from recycling, shredding, tending to plants and disinfecting the children’s toys and physiotherapy equipment. It was just for a few hours a week with Bernice’s assistance, but it was a real job and it was hers. As Rachel’s parents, we had always found her to possess quite a bit of confidence, but the increase in her self-esteem became very apparent to us as she continued working. The sense of pride she had as she prepared to leave in the morning and the joy she showed while sharing her accomplishments was incredible for us to see. What is also heartwarming is that the confidence Rachel has developed at work has extended past just her job environment. She has shown more comfort in facing day-to-day personal challenges and illustrates an increased ability to problem-solve situations when confronted with new tasks. A year later in June 2009, Rachel began her second job at city hall in Castlegar. Again, it was just for a few hours a week but the benefits to her have been significant. She shines about knowing Mayor Lawrence Chernoff and working for the city she lives in. Carolyn Rempel, director of corporate services for the City of Castlegar, states that “Rachel has a very pleasant manner, she always takes on her tasks willingly and she takes great pride in the work that she does.” She adds that “the staff at city hall appreciate her assistance around the office every week and (we) have enjoyed seeing her gain confidence and comfortably settle into our work environment.” They look forward to Rachel continuing to work with them over the coming years. When asked how she feels about working, Rachel says “I love everything about it. It makes me happy to work hard and help other people.” Now when she says “I love my life,” she includes her jobs in her list of things she is thankful for, and for that we are truly grateful to KSCL and the Castlegar community. Over the past three years, KSCL (which is funded by Community Living B.C.) has successfully assisted in placing 17 clients for work in the Castlegar area through the supported employment program. This translates into 25 weekly placements with 17 different businesses (some individuals work more than one shift a week and/or work for more than one business.) All clients are supervised by KSCL staff so the time commitment to the contact business staff member is minimal. Each individual is considered an employee of the business and is paid directly from their employer. On behalf of all those involved in the supported employment program at KSCL, we would like to thank Kootenay Family Place, the City of Castlegar, Andre’s AudioTronic, Kootenay Market, Blueberry Creek Community School, Kootenay Petopia, Soap n’ Suds, the Castlegar Heritage Society, H. H. Contracting, The Movie Company, Safeway, Joey’s Restaurant, Uptown Subway, Sears, Pharmasave, A & W, and the Castlegar News for opening their doors to this employment opportunity. They have had the wonderful opportunity to impact the lives of people in such a positive way, and we’re sure that they have seen the personal benefits of this as well. My alarm goes off at 7:30 am and I roll over and kiss my wife of 12 years. I am off to work for another day. In the mirror I look at my reflection and envision the day ahead. As I look closer into my own eyes I relive the past. Today I feel like I belong. It always hasn’t been this way. Although I grew up as the middle child in a loving family I spent much of my life living on the outside of my community. I felt so frustrated as I saw my brother and sister going out with their friends. Why was it so hard just to have a single friend? I tried getting friends and being part of the community. What did I not have that the community wanted? What did I do that made me feel so isolated away from people and the communities that I lived in? Does having Down syndrome change my feelings of belonging in this world? Questions that I shouldn’t have to answer, but I do. As the reflection looks back at me I know that I belong. In all aspects of life I have contributed to my community. I don’t want anyone’s pity. I don’t want people to celebrate my successes. I just want to be me. My participation in the world as a friend, husband, employee and consumer enhance my feelings of belonging. Although the world often sees me as being different, I refuse to see the world differently because I have a disability. I hate nothing more than feeling like a celebrity for doing everyday things. Throughout my life people have assumed that I didn’t want the same things they wanted. Nothing could be farther than the truth for me and most people with disabilities. I don’t devalue myself and my participation in my own community. As my day progresses at work I know people I am serving treat me a little differently. I am tolerant of this and try to change their perspectives by confidently completing my duties. Customers are just trying to be nice but I know they see me a little differently. I am cool with that. At the end of my workday people tell what great work I am doing. Thanks but it’s really nothing special; I am just doing my job. It’s funny to think that I am often singled out for having a disability, and when I am in the community I am singled out for just being a regular employee. Sometimes you just can’t win. I volunteer much of my life to help other self-advocates. It’s a choice I make. Not all self-advocates feel they can make an impact in their own lives. I had been told all my life that my expectations shouldn’t be high and that I would have limited opportunities to succeed. I understood better than anyone that just “belonging” would be the best path to follow. With my day complete and as I am brushing my teeth before bed, I glance into the mirror once again. I know that just like everyone else my routine will start all over again in the morning. I know that I belong. It is not what I have done, but the fact that society has let me do it. It’s 11:00 pm and I crawl into bed and kiss my wife goodnight. It is indeed, good to be me! Ever since I was little, I’ve been breaking new ground. The doctors told my parents that I wouldn’t be able to tell a joke (ex: Question: What does a cow look like when it’s about to give birth? Answer: Decaffeinated! ), and to do things independently. For example, I have learned how to balance my bank book and to cook meals. I like to cook Shepherd’s Pie (even though I don’t like to kill sheep), French toast, and other yummy treats. I’m proud to say that I proved those doctors wrong in all those areas! When I was old enough to go to school my parents decided to keep our lives as normal as possible. I went to school like everyone else and got good grades. I learned how to read and my grade 2/3 teacher, Mr. Collins, encouraged and taught me how to be a great writer. As you can see, my love of writing continues to this day. So far I’ve been published in a couple of magazines and I wrote a couple of letters to the editor in our local newspaper the Coast Reporter. For part of the summer and part of the fall I did some computer database work for the Sunshine Coast Association for Community Living (the S.C.A.C.L for short). I actually finished the work within two weeks! They expected me to take about a month! Towards the end of the summer, I went to another job interview with the Gibsons Community School. I was hired to work part time. My boss was surprised at how well I am on the computer. When I was working at ARTesia I began to take the bus more often. I took the bus so much my parents and I decided to get a bus pass, so now I can take the bus whenever I want to. Before you think I’m perfect, which I’m not I might add I must admit that, I’ve had some trouble dealing with changes in my life. In the year of 2006, I’ve been improving and accepting that the world is always changing. I have learned how to meditate and talk through problems. The meditation has helped me to remain calm, grounded, focused, and observant. Today I’m still breaking new ground with my yoga and Nia classes. They have helped me to improve my balance and have helped me physically and emotionally. I’m proud to say that I made it this far by taking a few risks. And I want you to believe that if I can do it, you can do it to!